Ok, who’s on a budget at the moment? Wave those hands in the air!! Yep, me too. Next question, who’s in need of a shopping spree? MEEEEEEEEEEEEE TOO! Well I can’t promise you new designer togs but I can promise you that if you are up for the challenge you can bag yourself some bargains and spend no more than £20. Now here’s the catch, throw your pride out the window and get yourself to your local carboot. However, you must choose your venue wisely. 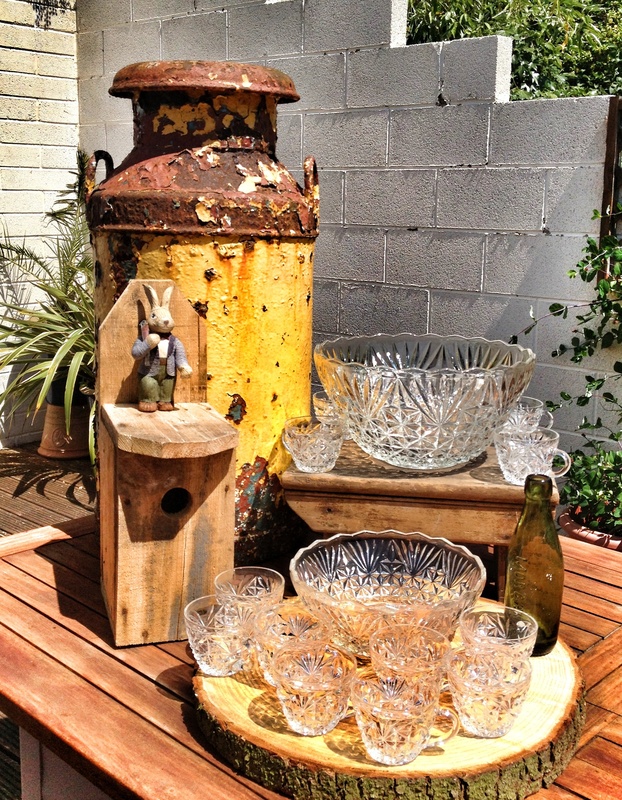 A few months back my husband and I got all our unwanted wares and took them to hock at the carboot. The experience was, to put it mildly, hideous. We got up crazy early and went out into the cold to our local car boot in the sports arena car park. I can tell you cold tarmac and overcast days = depressing. We still made £100 but I would choose a better time of year and a better venue next time. So this week, in this glorious heat wave that we are having I decided to go to a different carboot, this time as a punter. I headed to Farmer Palmers in Dorset which is actually a child friendly farm (which is fantastic by the way for a family day out) where they hold a car boot in one of their fields every Tuesday (until October weather permitting). Sun shining, gorgeous grassy fields and plenty of people made for a really fantastic morning and the people of Dorset have some brilliant things to sell. Here’s just some of the things I found……. Who needs a graden centre? I love the crazy mix of things you can find, sometimes something is just perfect as it is but sometimes you need to use your imagination. This next collection of pics just screams to me MAKEOVER!!!!!! All in need of a re paint! I would have bought the lot if I could have put it in my car, that would have kept me busy all summer doing makeovers! I’m in love with my new rusty butter churn (£10), it’s purely for decoration and I now have it sitting next to my honeysuckle in the garden. The 70’s punch bowl set was £4. It came in the original box with a picture of a 70’s party on the side of it (you can see this on my instagram), sadly it was missing the ‘Free Hostess book’ which I’m sure would have had some cracking tips. I will now have to have a themed party with some real old-fashioned punch. I had been after a bird box for ages and for £2 I should have bought all that he had. I might paint it bright colours but I haven’t decided yet, it could even be a decorative piece for a playroom or nursery with a little toy bird poking out of it. The little rabbit on top of it I bought purely to keep my daughter happy while going round the carboot, it was 20p. The rustic wooden stool was just so lovely that I had to nab it, £2. It’s now my side table for the sun loungers. The little green glass bottle was 50p and I thought would come in handy for dressing food pictures for my blog! The same goes for the ‘slice of tree’ as I call it (£1). There was a chap selling a whole pile of them. If I was doing a rustic wedding or party theme I would buy the lot and use them to place centre pieces on. (In fact I plan on doing a blog using this piece of wood to do a whole display of centre pieces so keep your eyes peeled). So that was my haul, all for £17.70 I know some people just aren’t into second-hand but I really do love it. But as I said before, choose your car boot wisely and make sure it’s a nice day because that’s when all the best sellers come out. Go on, give it a try I dare you.